An important consideration in divorce and estate planning that often gets ignored, underappreciated, or just poorly evaluated is the relative comparison of different account types: tax free accounts, tax deferred accounts, and taxable accounts. While many people tend to think of $100,000 as $100,000, the account type in which the money resides can make a significant difference to the effective value of the $100,000. For a high income taxpayer, the value of $100,000 in a tax deferred IRA which is to be immediately spent is likely worth less than $60,000 in actual spending power due to the deferred tax liability. However, for a modest spender who does not expect to need the funds for several decades, the $100,000 tax deferred account can be worth much more than the taxable account, in spite of the deferred tax liability. This Astute Angle post was prompted by a recent thread in a community forum for financial advisors where a question was posted regarding a divorce settlement. While the question applies directly to individuals going through a divorce, it has broader implications for all individuals, including those who plan to leave an inheritance to multiple beneficiaries. Is $100 in an IRA the same as $100 in a taxable account (with some embedded gains)? It seems to me that the IRA assets should be discounted to take into account the higher tax rates on income vs capital gains. Unfortunately, if financial advisors are delivering flawed advice on this question in a public forum, then it is safe to assume that consumers are getting similarly bad advice in consultations behind closed doors. The general logic, endorsed in the forum responses above, is that a dollar amount in a tax-deferred IRA is always worth less than the same dollar amount in a taxable account. The tax-deferred account (think 401k, 403b, or traditional IRA) has an unpaid tax liability that has to be paid when the funds are distributed from the account. A high income earner, for example, who faces a 40% tax rate (state + federal) and needs to distribute $100,000 from a tax-deferred IRA would only receive $60,000 from the IRA after paying taxes. Conversely, $100,000 of cash in a taxable account is worth the full $100,000. 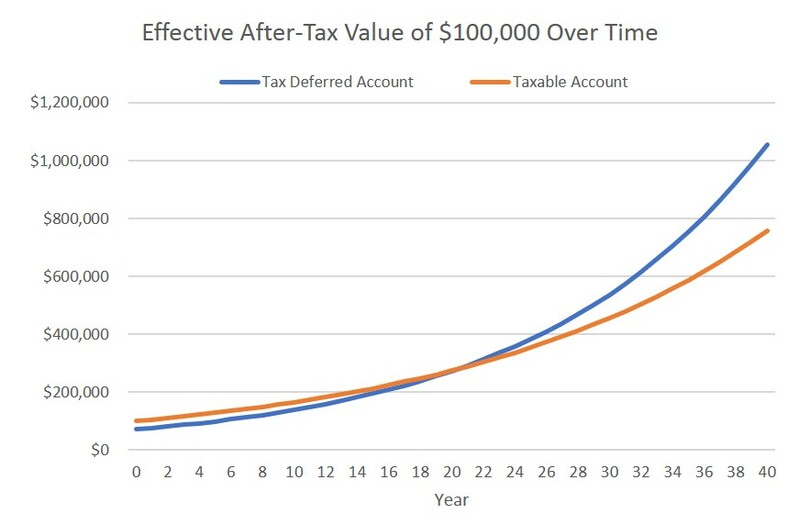 Expected Yield – The higher the yield, the more favorable the tax deferred account becomes. Portfolio Turnover – The more active the trading in the account, the more favorable the tax deferred account becomes. Expected Growth Rate – The expected growth rate works both ways, depending on other variables such as turnover and tax rates. Ordinary Income Tax Rate – Generally, a high ordinary income tax rate will favor the taxable account but if the yield and/or turnover are high enough, a high ordinary tax rate will favor the tax deferred account. Long Term Capital Gain Rate – The higher the taxpayer’s long-term capital gain rate, the more favorable the tax deferred account becomes. Tax Deferred Account Basis – The more basis (after-tax contributions) there is in the tax deferred account, the more valuable the tax deferred account becomes. Taxable Account Unrealized Capital Gain – If there are highly appreciated positions in the taxable account, especially concentrated positions, the less valuable the taxable account becomes. Time Period – The longer the time period before distributions will begin, the more favorable the tax-deferred account becomes. With all of these variables in mind, it is imprudent and negligent to argue that dollars in a taxable account are always better than the same amount in a tax deferred account. Providing proper advice on the question requires an understanding of these variables and then some calculations that go beyond the back of an envelope. Consider an example where we hold all variables constant using reasonable assumptions and adjust only the time period to evaluate the value of a starting $100,000 in the respective account types¹. 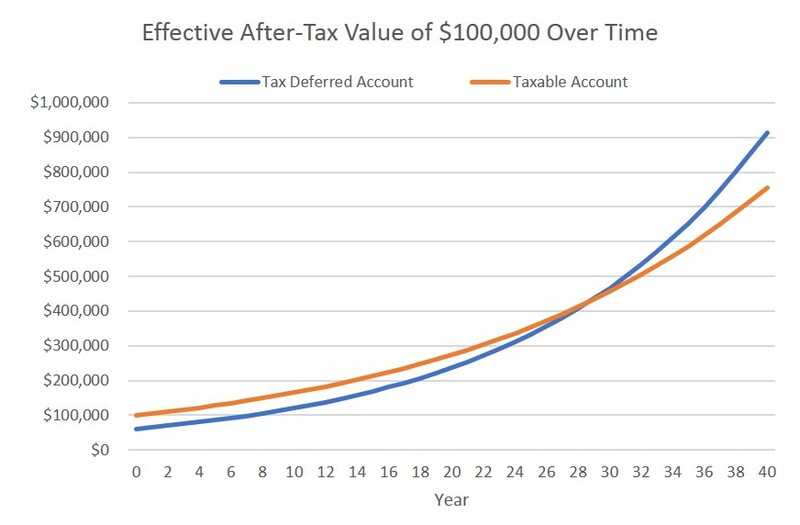 As you can see above, $100,000 in the taxable account is more valuable in the early years but if the time period gets long enough for the tax deferral benefit to materialize, the tax deferred account becomes significantly more valuable. This is to say that someone getting divorced at age 30 – with perhaps 35-40 years until they plan to begin drawing on the tax-deferred account – may benefit by receiving $100,000 in a Traditional IRA or 401k rather than the same amount in a taxable account. It also suggests that when you are considering what accounts to leave to various family members, it may be beneficial to leave taxable accounts to family members who are likely to need the money in short order and tax deferred accounts to young family members who are not likely to need to draw on the funds for decades to come. Below we consider the same scenario but update the tax assumptions to assume that the federal tax rate is 35% in the working years and 25% in retirement, when the funds are distributed. Note that the breakeven period – when the tax deferred account becomes more valuable than the taxable account drops from 29 years to 21 years. One takeaway of this Astute Angle post is to understand how rule-of-thumb logic can be grossly misinformed and lead to bad decisions. In this case, the idea that taxable accounts are more valuable than tax deferred accounts on day 1 is almost always true but this logic implies that the money is to be spent immediately. If there is any meaningful investment period for the power of tax deferred compounding to happen, then the tax deferred account can be far more valuable than the taxable account. This means that individuals who plan to leave assets to more than one person would be well served to consider the specific circumstances of each individual. A young, financially successful beneficiary who spends modestly may be best served to receive $100,000 of tax deferred assets whereas an older beneficiary who faces a high tax rate and needs the money immediately may be best served to receive $100,000 taxable assets. Finally, the idea that a participant in a divorce should always prefer $100,000 of taxable dollars over $100,000 of tax-deferred dollars is grossly wrong as we have tried to demonstrate above. Not only is it bad logic but this common line of thinking by the other party in a divorce can be used as an advantage in the settlement mediation. ¹Assumptions in the original scenario: 3.0% yield all subject to ordinary income taxes, 4.0% growth rate all subject to long-term capital gain taxes, 20% portfolio turnover (average holding period of 5 years), ordinary income tax rate of 35%, long-term capital gain tax rate of 15%, state tax rate of 6%, itemized tax return, no IRA basis, no early withdrawal penalties, and no capital gains in taxable account at the start.